December 15, 1938 to April 3, 2017: Christine loved to fiddle around with the 'Old Time Fiddlers' and to be with her beloved service dog Tiffany. Christine was born to John and Myra Drewek and two-year-old brother Tom, who welcomed her birth on Dec. 15, 1938, in Milwaukie WI. She brought warmth and happiness to all, and she was a daddy's girl. Christine's father John and grandfather, Adam Drewek were both police officers in Milwaukie, WI. (Shorewood district) and she had a great respect for authority. Christine attended grade school, middle school, church and learned to ride horses and show dogs. She loved to spend time at her grandmother's farm with all the animals. She spent time with her Aunt Gert Weise, who encouraged her to learn the violin and the viola and follow her passion for music. In 1954, they moved to California, where she graduated from Glendale high school in 1956. Her father and hero passed in1957, before she had completed nursing school 1958. Christine married John Grentzinger in 1957, and became a widow in 1961. She married again in 1962, to Emil F. (Ike) Hoff, the father of her daughters, and lived on 80 acres in Bend, OR. In 1968 she married Phillip Lang who had 3 sons of his own, Terry, Tim and Marvin and they moved to Portland, OR. In 1970, she went on to receive a bachelor's in nursing at the U of O. In 1974, she was a night nurse supervisor at Emanuel and Meridian Park Hospitals. She (nursed for 40 plus years), although she would have rather been a Veterinarian, her love of animals was lived out on her time on her ranch in Bend, (1962-69) and later in Canby, (1977-87) raising her 2 daughters, Linda and Karen, and showing horses, dogs, and goats. In 1989 she moved to Woodburn at the Senior Estates, and it was welcoming. It gave her an active life and social networks. She enjoyed Lady Putters, swimming, cards, church, music makers, Elks, bingo, and travel for both Christine and her mother, Myra, (who passed in 1999). Now free to travel more, Christine was on the go! Christine traveled to 4 continents, all 50 states, her favorite was Hawaii. 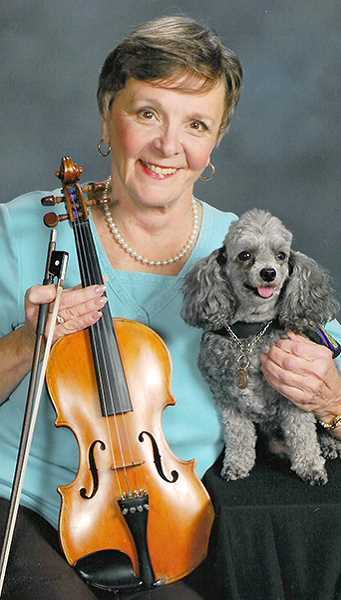 She loved to fiddle around with the "Old Time Fiddlers" and to be with her beloved service dog Tiffany (passed 12/12/16). She was the Oregon State Senior Fiddling Champion and National Contest Winner in 2009. What we loved about her was her; zest for life, "energizer bunny," always entertaining, a great sense of humor, loving mother, devoted daughter, made friends for life, never stopped learning, and adventurous spirit. She was able to write a bucket list and enjoyed lasting memories with her friends and family. She enjoyed sky diving at (I-SKY), a gift from her sister-in-law, horseback riding, a hot air balloon ride and she wrote a song "Angels in Blue" thankful for our police officers service (2016), and much more. Christine faced every day with a song in her heart and a positive, brave attitude, and a sense a humor. "Live life to the fullest everyday" an example for all! Survived by her Uncle Bob Weise and Aunt Dorothy White, (Myra's siblings), brother Tom Drewek and his 2 sons, Christopher, and Douglas Drewek, daughters, Linda Lang and Karen Clark, stepsons Tim and Marvin, 4 grandchildren, 5 great-grandchildren, 12 cousins, and numerous friends and family. A Celebration of Life will be at Noon to 4 p.m. on April 14. At the United Methodist Church (community center), 700 N. Cascade Dr. in Woodburn. Mom's request was: Fun, food, friends and fiddling, and potluck. Yes, Potluck! !